UPDATE - Tuesday 18th February: Patch 1.07 is now available for Xbox 360. UPDATE - Friday 14th February: Patch 1.07 has been released for PC and PS3. We'll let you know as soon as 1.07 arrives on Xbox 360. The latest batch of title updates have been released for PES 2014. To upgrade your game, just make sure your console is connected to the internet and then simply load up PES 2014. Once you've done this, you'll automatically be promoted to update. Go here to download the latest patch for PC. * The following features have been implemented in response to recent user feedback. 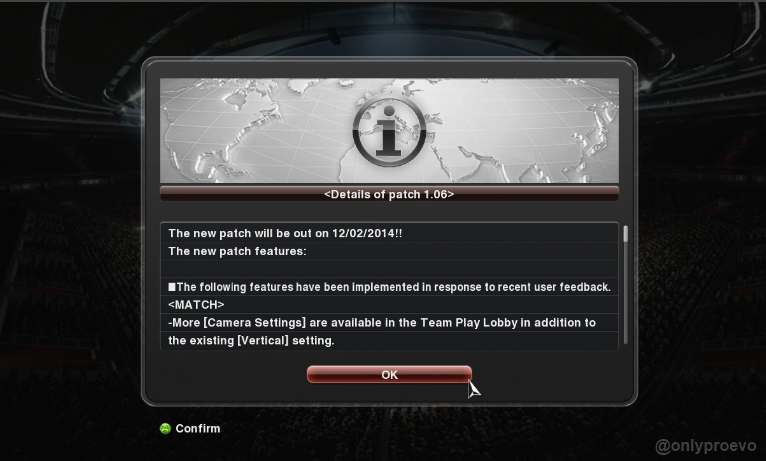 - More [Camera Settings] are available in the Team Play Lobby in addition to the existing [Vertical] setting. * The following issues have been fixed. - Online match results shown after the final whistle were sometimes displayed as [%d]. - Random player form settings were not correctly applied when playing consecutive matches. - Once a team's lineup of substitutions had been edited, saved and then loaded again, changes were sometimes lost. - Player icons on the pitch would sometimes disappear. - Edited player faces changed when the patch file was implemented. * In addition, we've fine-tuned each mode to improve your overall gaming experience. - Correct roles can be given to players who are substituted then moved into a different position at the same time. - Improvements were made to the sensitivity of cursor movements on the Game Plan screen. - Users can now correctly select their ML teams in Team Select as opposed to receiving an error stating that the data could not be used as it belonged to another user. - Player names will be correctly displayed when team data exported onto a different hardware system is imported (As opposed to DUMMY). -￡0 wage contracts can no longer be signed. This occurred when a player both submits a transfer request and receives an offer on deadline day of the Transfer Window. - The game will now correctly recall search conditions when looking for players. - Freezing issues following the application of Patch1.06 were fixed. * Other minor adjustments were made to improve the overall gaming experience in all other modes.